On purchasing my poppy just over 3 yr ago, I wasn’t given kc papers, nor was I ever shown papers for her parents. The owner explained she didn’t want the litter to be bred etc, & just selling as pets. I love her so much, it’s just I have seen, over the yrs other Coton’s. They are half the size of my lil Pops, & weighing in at no more than 6kg. I am really interested to find out IF my poppy is a True Coton (she has also been spade). We go for approximately 2 15 minute walks per day, she plays on & off 10-15 mins at a time with me with her toys in the day. But she sleeps in between that (more than play). Also sleeps a minimum of 7 hrs str8 through the night. Sometimes I worry about her? As she always (for a 4 yr old) seems tired. Is this normal for a Coton. Are there vets, professionals etc that could tell me.? I am just really interested. She also has a pink nose, & doesn’t have the black rimmed eyes. (She did as a pup). I have never been told by my vet when I’ve taken her for injections, check ups etc that she’s overweight! Any help or I for would be much appreciated. 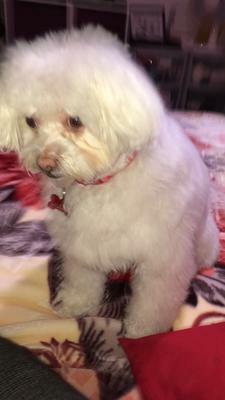 Comments for My Coton is 8.3kg 4, yrs old. Is she true Coton? Poppy sounds perfect! My Cal weighed more than other Cotons, I was told by many vets that 'breed standards' are averages so just like people you will get bigger and smaller ones on the spectrum. I had Cal DNA tested and he was mostly Coton, with some Maltese (grandparents on one side)- which you would think would make him more petite! Just goes to show how genetics can be fickle. As far as the nose - is it snow nose? Cal had that sometimes. They adapt to your lifestyle, so if you aren't always on the go they tend to be mellow too. My Cal had mild luxating patellas so that could be something, but exercise was the best thing for him to build the muscles around the kneecap (stairs particularly worked to strengthen and some PT). They are each beautiful unique personalities in their own right. Your doggie sounds like my Rhylie. She'll play and run and run then she spends a great deal of time sleeping. It depends on what activities she does during the day. She goes on play dates with my best friend's dog and when she comes back from there she spends a lot of time sleeping. Her best friend and her play and play and she wears herself out. She loves it though and anytime I say "Want to go see Dutchess" my Rhylie-girl is at the door waiting!! I wouldn't worry about your dog's weight, either. Cotons weight can be as high as 14 pounds from what I've read. My dog is 3 years old and has always been small. She weighed 7 pounds up onto this July when she finally started eating more and now she weighs 8 pounds. She has gone up and down on her weight depending on how active and how much she eats. My vet says she is healthy and a small Coton. She gives love unconditionally. She loves people and loves attention and people love her and her personality! Does the size and weight really matter to you? She looks and sounds very normal as ours sleeps a lot and likes to play 10-15 minutes at a time. With any breed, you will see size variances. For example, we previously had a 5 pound Yorkie, but a neighbor had one that weighed 15. Both were from registered breeders and had papers. Did my dog love me more than theirs? If you really need to know, I beleive you can have DNA testing done. I would also suggest that you check with your vet regarding her activity and diet just to make sure she is getting the optimal amount and quality of food. My Coton had a black nose, one time he was rubbing his nose in the blankets trying to bury a dog biscuit in the bed. I caught him with my camera just as he finished burrowing and his nose was all pink! After a short period of time his nose was black again. I dont think nose color is determined by the breed. If you have not yet brought your dog to a Veterinarin for a physical check up, it might be a good idea to know the general healh of your dog. They can also do a dna test to determine the breeds. There are many reasons she may be sleepy.